Finally, it’s here. The LP that we’ve been waiting so long for. The LP that promises to kick the Tall Ships Youth Trust off the top spot in a Google search for “Tall Ships”, those philanthropic sons-of-guns. But there’s been no rush for this three-piece who produce angular, loop riddled epic soundscapes. A couple of EPs have teased us in previous years, but they in themselves hint to what Tall Ships know is the most important and precious commodity when it comes to their music. Time. There hasn’t been a hurry, either logistically in creating this record, and also within their music. 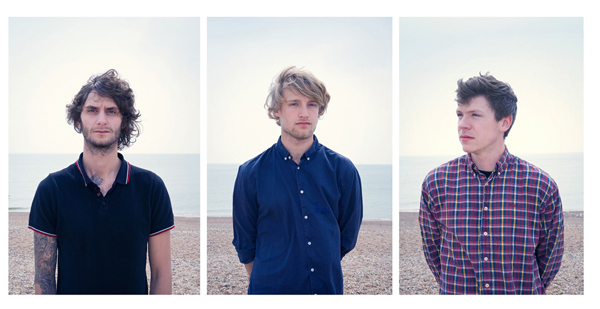 The three-piece met at an Art College in Falmouth, and perhaps this can explain their expertise at using the concept of white space in their music to its full potential. A lyric from one of their single b-sides, ‘Safe as Houses’ encapsulates their attitude to song structure effortlessly: “You use your words like bricks, your pauses like mortar.” And these guys are the Grand Designs of music making. Kicking off the show is ‘T=0’, the first single to be taken from the album. It acts as the perfect front door to the record. Instantly, the drums crash and shudder while guitar loops layer and interweave. Everything subsides a little in the nucleus of the track, as Ric Phethean explains: “Time won’t wait for anyone.” One swift wave of lyrics later and the noise picks up again. There’s not a loose bassline or drum beat to be found anywhere. It’s reminiscent of when the Mystery Jets were capable of similarly brilliant organised chaos, with Zoo Time pulling off the same show stopping effect. 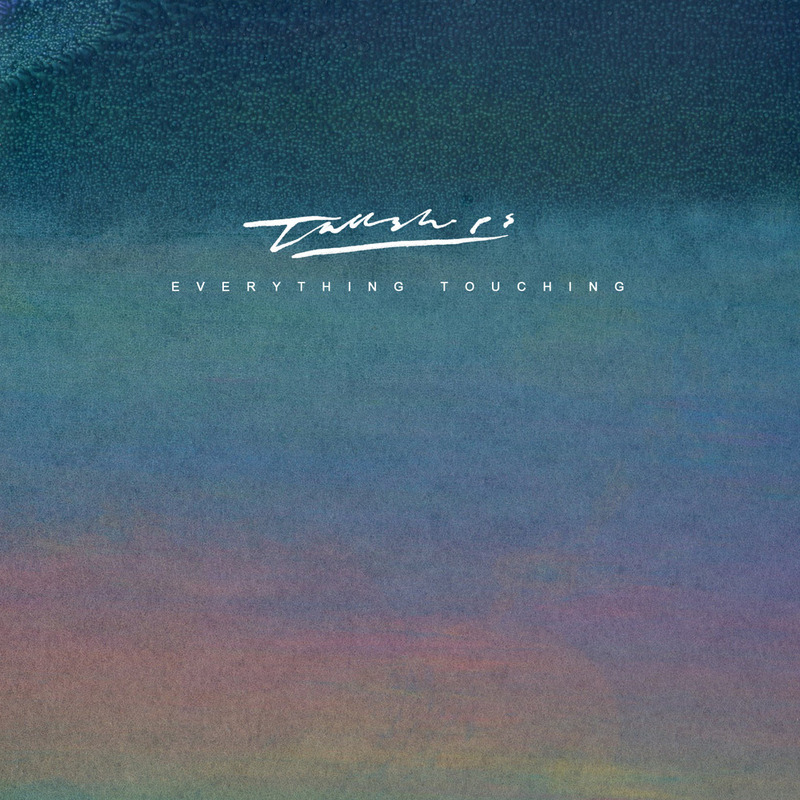 The theme of time also runs through ‘Books’, an EP track that’s been built upon. It sounds sharper and tighter, something that can be attributed to the track having time to mature and age since its inception. It trips into a little dancey-synth number initially before the chord is cut and in the slow-down, Phethean sings: “Time is precious, and time will forget us.” The concept of time shines clearly through much of the record, but more interestingly it often slips into the realm of life and death, and it is this theme that really feels like the true undercurrent of the album. ‘Ode to Ancestors’ is another track lifted off an earlier EP, but on Everything Touching, it’s the lynchpin track. It’s the nucleus around which everything else orbits. The original version felt like it hurried towards its own end, but here it’s a patient, beautifully crafted moment of clarity. The slower opening gives the lyrics extra weight, meaning and cadence. It also instills a feeling of wonderment on ourselves as a species over the unlikely combination of chance that each and every one of us has won our own evolutionary race. As the track prepares to fire itself out of a cannon and erupt into a fitting finale, the lyric “A million year masterpiece” just dangles like a strand of DNA before the storm. It feels like it encapsulates the Tall Ships story. Plenty of these tracks have existed for a while, but with time, they’ve been able to grow into something altogether more perfect and life-affirming. The album ends with ‘Murmurations’, described by the band as “The most Tall-Ships song we’ve ever done.” Nine minutes long, and taking about two-thirds of that time to really erupt, it’s a brave statement that continues to show the band aren’t afraid of pitching things a little left-field. It trickles along initially, slowly building, and gradually sails into a stormy finale. Part of what makes this band so fantastic is their wonderful DIY aesthetic. Here it includes having a chorus of 30 friends and family sing their hearts out on this track. It’s an euphoric ending to a complete record that feels deeply personal, life-affirming and altogether life-changing. Well, this one’s been a long time in coming. I’ve spent the last six months willing myself to write something about this band, and the time finally feels right. Tall Ships now feel like an integral part of my being, like a kidney. Except, probably more important than a kidney, because you can always get rid of a kidney. The heart seems like too much of a cheesy metaphor. So let’s just say they are a crucial internal organ of some sort. I first stumbled across ‘Plate Tectonics’ through a friend posting it on Twitter. I was instantly smitten. It seems fair to say that the ol’ time-signature switcharoo has been massively influential in the last five years or so in the indie/alt-rock landscape, with the like of Foals and Vampire Weekend creating a plethora of cheap knock-offs and wannabes. I had the displeasure of seeing a local band this year who just seemed to throw in a time-signature switch whenever they ran out of words or ideas on what to do next. This is why this band are special. They have such a focused energy on making the switches fit in in the context of the track. It’s always there for a reason. Not only that,but to create layers of sound, guitar loops are often used. These loops and time signature switches are perfectly exemplified in ‘Plate Tectonics’. Initially, it’s a lyrically smart catchy-shindig of a track, before turning round halfway through, pulling up its socks and running in a completely different direction. In the second half, one fretful riff sets the pace before other layers of guitar riffs are spread over the top, creating some kind of deep-fill sandwich of noise. There’s always a desire to want to praise the bass and percussion as well, but it does what it was built for; it acts as the structure that allows the track as a whole to shine. It’s the delicious bread in our bizarre sandwich simile. People sometimes forget the bread, but without it, you are just licking sandwich filling from your hands. So that’s one track. I could sit here for forever and a day and turn every one of their tracks into delicious food-based lexical terms. But I don’t want to spoil the fun of other people’s journeys, but I really do want you to dive in. Head first. One of my favourite people in the world bought me a ticket to go see their live show when they were on tour with Los Campesinos a few months ago. Unfortunately I couldn’t make the date in the end as I was several hundred miles away, but she said something that resonated with me, and it’s something I want to steal share. Tall Ships use vocals sparingly; they are intelligently aware of the fact that it’s just one part of music. Without being too disparaging of Los Campesinos, they almost overload the listener with lyrics. At times it works, but at times it leaves the listener feeling full and unable to absorb any more meaning. Tall Ships are able to say more with one sneaky verse of lyrics in a track; it has such a powerful impact. The white space of vocal silence acts as a framing device to magnify what is being said. It also allows the actual music they are making to stand out too. A track like ‘Vessels’ is a case in point. The track is so brilliantly constructed, I can never get tired of hearing it. 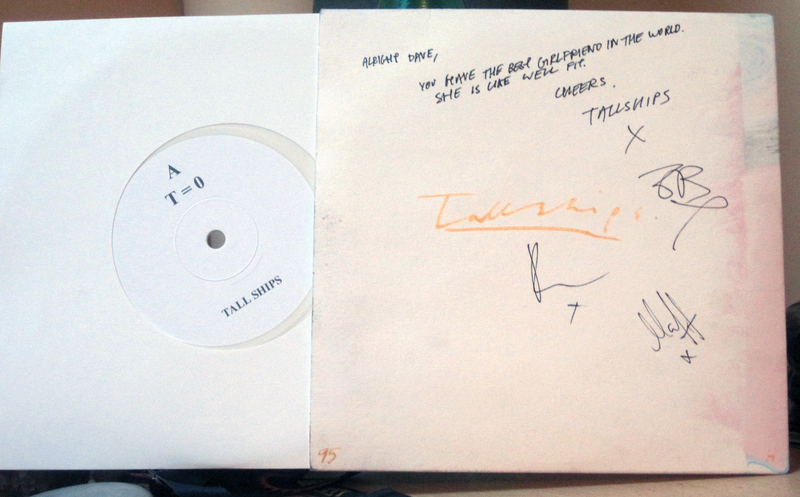 So, the wonderful person who did get to go to the show got me a signed white vinyl single of ‘T=0’, shown in the picture. This track is the first single from a forthcoming debut album from the band. According to the band’s Twitter, an announcement will be made next week regarding a release date and a UK tour. Catch them while you can.